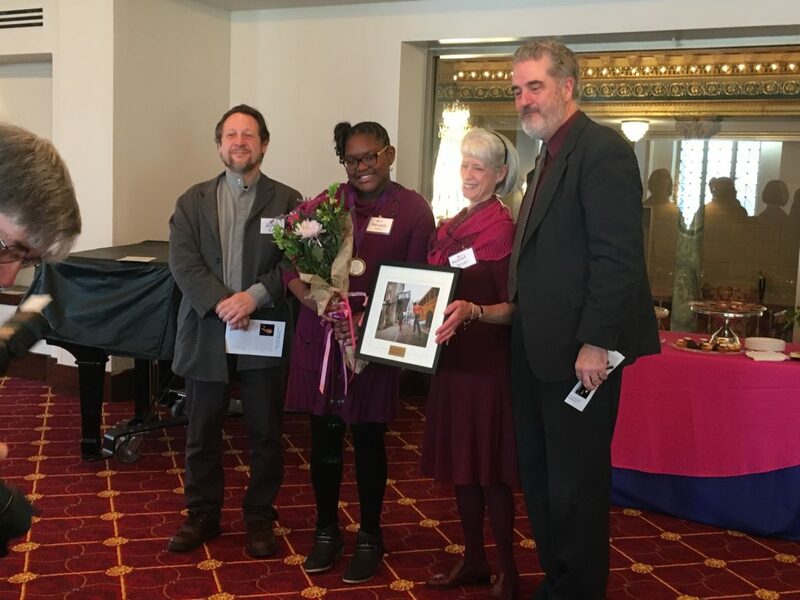 February 4th, 2019 – Nevaeh White accepts the award for winning the Barbara Ann Peters ‘Write Your Own Opera’ contest. Each Spring, Guilford County fourth grade students have an opportunity to enter a short-story writing contest held by Greensboro Opera. 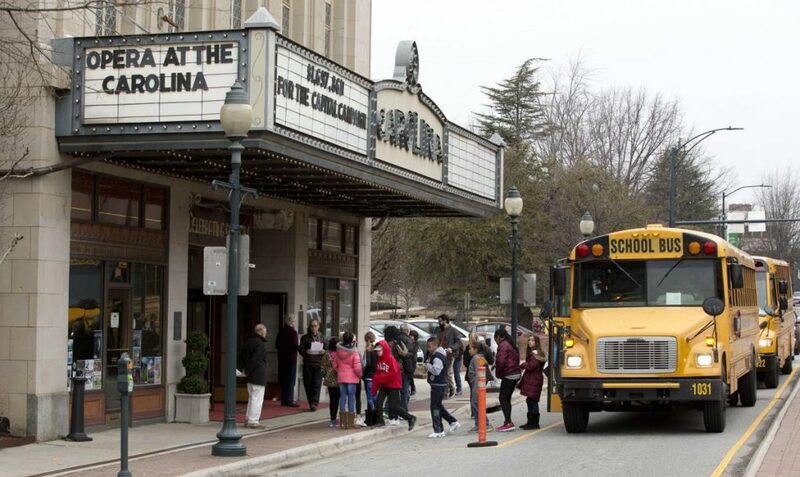 This year, approximately 60 students competed for a chance to have their story transformed into a libretto by David Holley, Director of UNCG Opera Theatre, and then set to music by a resident composer from UNCG’s School of Music. The result: a ten-minute opera which is performed at Opera at the Carolina the following February! This year’s winning submission for the Barbara Ann Peters “Write Your Own Opera” contest is Nevaeh White, from Monticello-Brown Summit Elementary, with her entry “The Showdown”. “Her story about bullying stood out because it focuses on a topic many schools are anxious to address,” said Mr. Holley after the debut performance on Monday morning. Composing partner and Associate Professor of Music at UNCG, Alejandro Rutty, created the score for the Opera. Nevaeh also choreographed parts of the opera which will be seen by approximately 6000 students this week at the Carolina Theatre. In addition to six performances at the historic theatre, offsite performances during the Greensboro Bound Literary Festival and at the Weaver Education Center are set for later this year. Photo courtesy of News & Record. This collaboration with Guilford County Schools and UNCG also offers opportunities for Triad university singers, conductors, and musicians studying at the undergraduate, graduate, and doctoral levels to gain experience performing opera in the Carolina Theatre. With your support, this educational outreach program is underwritten in part by ArtsGreensboro’s Project Support Grants. To support more programs like these, please give to the arts through our annual ArtsFund campaign by clicking here. Or to learn more about ArtsGreensboro’s mission and commitment to the arts landscape, please visit us online at artsgreensboro.org.